For the last 12 years, director Robert Zemeckis has campaigned for the seemingly bottomless creative wells of motion-capture animated films, releasing The Polar Express, Beowulf, and A Christmas Carol with impressive if often creepy visual results. With Flight, he returns to live-action filmmaking in a deeply affecting human tragedy not unlike his last film, before his stint in animation, 2000’s Cast Away. Indeed, both pictures feature a protagonist beset by an astoundingly filmed plane crash after which they’re left to reconcile their personal demons. Both titles have multiple meanings, and both feature tour-de-force performances from their leading men. In the earlier film, Tom Hanks, alone on the screen for much of the film, proved he was capable of captivating his audience with almost no supporting players. 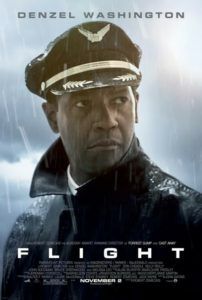 In a not-so literal way, Denzel Washington’s performance as a commercial pilot tortured by alcoholism proves Flight is a one-man show. Washington delivers one of his most complex and intricate performances as Whip Whitaker, who we first meet in a shabby Orlando hotel room at 7 a.m., where, accompanied by his naked flight attendant and casual lover, he snorts a few lines of cocaine to relieve his morning hangover in time for the 9 a.m. flight home to Atlanta. Braving a downpour, Whip guides the plane into takeoff with 102 “souls” aboard, his new co-pilot (Brian Gerety) observing Whip is not at his best and quotes the manual to him whenever possible. After Whip sneaks three on-board vodka bottles for a massive screwdriver, he takes a nap only to wake and find the plane has had a mechanical malfunction. What follows is a nerve-racking crash sequence where Whip miraculously pulls the airliner out of an uncontrolled dive and lands the plane in a field. With only a handful of casualties, Whip is declared a media hero, pulling off a feat no other pilot could ever complete. Again, much like Cast Away, Zemeckis orchestrates the crash sequence in master strokes, Whip turning the plane on its head to stop the frenzied descent as the director controls every frame with carefully considered editing and camerawork. This wowing sequence might, for a moment, unfairly shift the audience’s attention away from Whip’s personal troubles, except Washington’s performance goes into territory dark enough to surprise the audience in other ways, creating a balance between the film’s opening spectacle and the subsequent human drama. In the aftermath of the crash, Whip is found to have a 0.24 blood alcohol level and faces possible criminal proceedings. In his corner are a former flying buddy and pilot’s union rep Charlie (Bruce Greenwood) and their rigid attorney Hugh Lang (Don Cheadle); only gradually do they discover how serious Whip’s condition really is. Moreover, Whip is desperate to conceal his drinking problem. To avoid the press, instead of going home he stays at his late father’s farmhouse and closed crop-dusting business. He pours every drop of booze down the drain, and for a moment we believe he might have changed. Certainly most would be shocked into sobriety by the trauma of a plane crash. Whip’s conversations with other survivors and one cancer patient in a hospital stairwell confirm everyone, including his attorney, has turned to religion, claiming the crash was an “act of God”. When his co-pilot’s wife repeatedly utters “Praise Jesus!” their faith become suspect for Whip, who knows that he and he alone landed the plane. Meanwhile, he forms a romance with recovering drug addict Nicole (Kelly Reilly), having met her during his post-crash hospital stay where she was recuperating from a heroin overdose. She now attends AA meetings and finds she can’t be around Whip’s eventual plunges back into heavy drinking. Everyone around Whip tries to help in their way—save for Whip’s hippie enabler friend played by John Goodman by way of Jeff Lebowski—keeping him away from alcohol and drugs, and also preparing him for an upcoming hearing with a stone-cold investigator (Melissa Leo). Screenwriter John Gatnis (Real Steel) carefully deliberates over how Whip landed the plane through his high-functioning alcoholism, spending perhaps too much time deciding how he will pay, if at all. This difficult character has no problem lying his way through official inquiries, while he begs his friends to help him sober up in time. The film’s most tragic moments come when Whip finds himself tempted after a week or so without drink. On and off the wagon he goes, behaving like a tried and true alcoholic plagued by a disease, and not some schmaltzy Lifetime Original movie version. 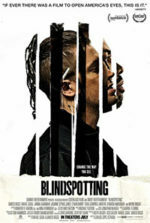 Washington’s character propels some very ugly behavior, and thus the film’s R-rating is very appropriate, such as when he shows up drunk on the doorstep of his estranged ex-wife and son (Garcelle Beauvais and Justin Martin). Another actor lacking Washington’s natural charisma would not have been able to maintain the audience’s sympathy throughout such low emotional trials. 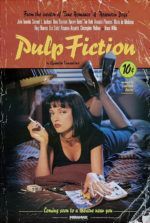 Although in the past Zemeckis has preoccupied himself with the technical aspects of his directing—Who Framed Roger Rabbit, Death Becomes Her, and his motion-capture work was all driven by incredible technical feats more than captivating characters—with Flight he’s never more concerned with the method of his film than with Whip’s perspective or Washington’s performance. Where Zemeckis traditionally invites bold, slick camerawork, outside of the crash sequence cinematographer Don Burgess delivers a series of intimate shots in confined rooms, allowing the actors to flourish. If Flight does nothing else, it negates what Zemeckis spent the last decade or more trying to prove in a series of flat, emotionally vapid animated films. The film shows us how a rather simple story can be elevated through the pains and complex inner workings visible on the human face.